There are many personality types working in coworking spaces, just probably not in the same distribution as in general society. In the Global Coworking Survey, we made a rough personality comparison of members in three groups, who differ in how they react with their normal environment. Members could choose to categorise themselves as ‘more extroverted’, ‘more introverted’ or a mixture between the two. The independent analysis of the 2018 Global Coworking Survey was supported by Essensys, Nexudus & WUN Systems. Download the free report here. All three personality types are visible in coworking spaces, some more than others. Almost every second member describes themself as mixed (ambiversive). Roughly 1 in 3 members considers themself as ‘more extroverted’ and 1 in 5 as ‘more introverted’. Around 2% of respondents answered with ‘don’t know’. Women are more likely to choose one of the pole types. The proportion of extroverted personalities among female members is almost as high as the total number of those with mixed personalities. Men position themselves predominantly in the middle. However, more extroverted than introverted male members work at coworking spaces. An interesting result can be seen when comparing members by their professional status. Freelancers are roughly equally represented among all personality types with around 40%. There is an above-average proportion of extroverts among entrepreneurs who manage employees. In the introverts category, the significantly higher proportion of employees is especially noticeable. However, to avoid stereotyping, considerable numbers of introverted entrepreneurs and extroverted employees are also found in coworking spaces. Freelancer’s share is slightly increased in the ambiversive category. Other groups such as students and job seekers, among others, are also more visible in the statistics. ‘More introverted’ members often speak with around 3 other coworking members per working day, around half as many than ‘more extroverted’ members. However, this number says nothing about the quality of the contacts! On average, they regularly work in smaller coworking spaces, with half as many members compared to both other personality types. 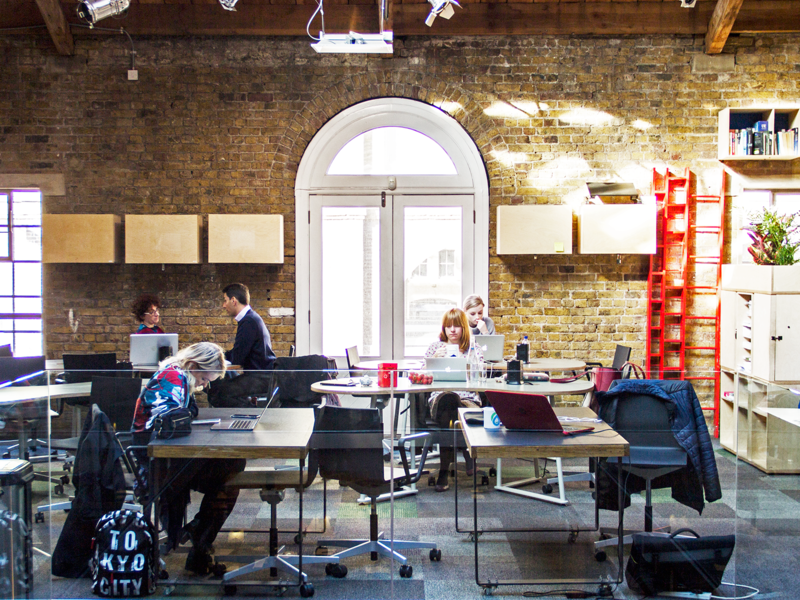 An extremely high proportion work in coworking spaces who class themselves as having a ‘hip and trendy’ atmosphere. Their priority is probably more the relaxed and tolerant way of working in offices. Normally the share of members who know each other and with whom they interact increases in smaller coworking spaces. ‘More introverted’ members struggle with this. They know proportionally fewer member’s first names, although not that many less than other personality groups working in bigger coworking spaces. In total, they come into contact with every twelfth* member present during the working day. These numbers also affect the sense of community. Considerably less of this group feel a sense of belonging to a ‘community’. Although almost the half feel strongly to very strongly connected to the community of their coworking space! ‘More introverted’ members are not fans of completely isolated workspaces. All personality types prefer a mix of open spaces with private retreats, although ‘more introverted’ members rate this a little more. A small majority like to work in open workspaces. All personality types would more often prefer a private office compared to their current situation. Though ‘more introverted’ members rather opt for a single private office than a team one in this case. Despite the high proportion of employees, more introverted members mostly work alone, a situation they prefer. ‘More introverted’ members rate coworking spaces only slightly worse than the other two personality types. However, their rating slips somewhat more dramatically when considering value for money. So why do they work in coworking spaces at all? The overwhelming majority of introverted members decided on their own accord to work in a coworking space. They are even more likely to pay for it out of their own pockets. More than among other personality types, the main membership attraction is the social atmosphere in a coworking space! Though much fewer intend to get in touch with (all) people. Open workrooms follow in second place, whilst the proximity to home comes third. When asked what they expect from other members, the most opted result was surprising – small talk! However, we didn’t ask about the quality of the small talk. With the exception of ‘sociability’, they expect significantly less from members in all other areas. In fact, every third ‘more introverted’ member even expects nothing at all. This is where they differ the most from other personality types. Their expectations are especially low when it comes to ‘quick help’, ‘shared meals’ and ‘event invitations’. This doesn’t necessarily mean that they wouldn’t be pleased with invitations and help, rather they just rarely expect it. Above all, coworking spaces develop creativity and the skill-set of ‘more introverted’ members. They enjoy better workdays and get more done. Most importantly, like the two other types, they feel less isolated since working in a coworking space. The majority of them have previously worked in a home office, and an above-average proportion has also worked in traditional offices.